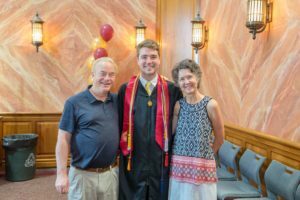 The first week of June 2018 was a whirlwind of graduation week (from college) for our son, Morgan, and our family. Graduations are an exciting time filled with activities and emotions for every family. And for us, it was a major milestone for Morgan to make it through four years of school with no serious allergic reaction with his allergies to peanuts, tree nuts, sesame, fish and shellfish! Morgan participated in and experienced so many wonderful adventures in 4 years of college: clubs, student government, study abroad, internships, jobs, friendships, roommates, and intimate relationships. 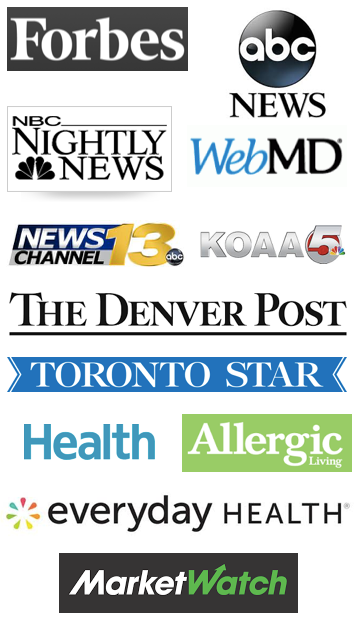 Every one of these were affected by his food allergies, and he learned how to become an even better advocate! The graduation has brought back memories of how far Morgan has come since he began college almost 4 years ago. And Mom has had to do a lot of growing too! 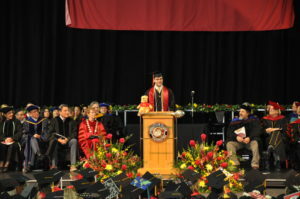 When Morgan graduated from high school, (which I wrote about in a blog post here four years ago), we knew he was heading to the University of Denver. He really wanted to live in the dorm with a roommate in the Living and Learning community called the Pioneer Leadership Program. Over that summer in 2014, Morgan and I had one meeting with the chefs at the school, and he determined that with their training from AllerTrain, and their willingness to continue to learn, it would be safe for him to live in the dorm and eat cafeteria food. We had a single room with a kitchen as a backup, but that would mean he couldn’t live with the Leadership program, which was a major barrier to participation. He and I had many conversations that summer as I passed the baton, so to speak, to him to determine how he was going to tell his assigned roommate, Thomas, about his food allergies. Truth be told – he did so in a text message after having coffee for 3 hours chatting about how they each wanted their living situation to play out!! That was my first lesson in letting go. I really wanted for him to explain EVERYTHING about food allergies and his asthma to Thomas. And that was the first in a long list of Morgan learning how to take care of himself, in the way HE wanted to create his relationships and his life in college. 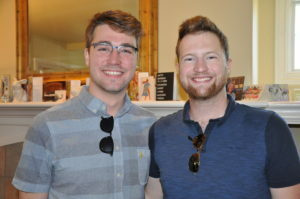 Through the years, Thomas was a roommate with Morgan during their first, third and last school years, and he was a travel companion through Europe prior to studying abroad. He now understands everything there is to know about Morgan’s food allergies, recognizing allergic reactions and how to operate Morgan’s Auvi-Q. When I thanked Thomas for being such a wonderful roommate through all the years, he responded, “If I had to give up peanut butter to get a best friend, it’s a small price to pay!” Truth be known – he gave up a lot more than that, but this is why my son was so adamant to figure out a way to have roommates in college! Morgan’s activities in high school included playing piano for the Choir and participating in Speech & Debate, which allowed him to experience overnight trips and roommates. This helped him so much with the college experience, and having to manage food allergies. I’d really encourage all parents to allow and encourage your children with food allergies to be involved with activities in high school that require them to go on overnight trips; to manage roommates in hotel rooms; to be responsible for carrying their medication(s); to train chaperones and teachers about food allergies; and to be faced with situations that don’t go as planned. Morgan wrote about a last minute invitation to a business lunch here which offered an opportunity to advocate on the spot while working in college. The difference between high school and college really is that we parents have to trust that we’ve done as much as we can do to train our children how to make good choices. While they are still at home, we hear more about what’s going on. 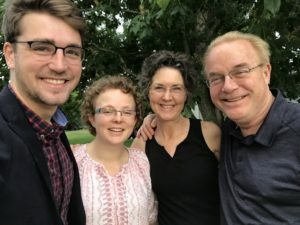 Once they go to college, a healthy relationship for my husband and I did not include having our son check in to tell us what he was eating, or to share about every one of his activities. We did want to keep track of his trips and where he was located, but when he was in Denver, we would frequently hear from him via text every few days or so. And we spoke with him only every few weeks on the telephone. 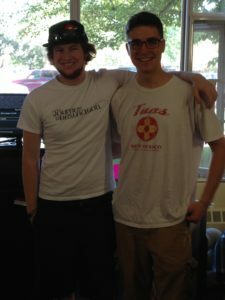 We live an hour away by car from Denver, so he was able to come home to visit (or we would go to DU) every 3-4 weeks. We are still working on me learning how to “zipper my lippers” on his medical needs! It truly has been a one day at a time process for me to learn how to let go of my obsession around Morgan’s health, which I wrote about in a blog post here. Thankfully he never had a serious allergic reaction in college warranting a trip to the ER. He did land there once with a mystery stomach issue, which was enough excitement for us. I credit Morgan’s ability to manage and remain vigilant about his food allergies every where he went. When he left to travel through Europe before his study abroad in England, I counted the days that he would be gone. It was 140 days. I counted them down every night. It was the longest 140 days of my life! We kept in contact with him more than we ever did when he was just one hour away from us. He managed everything beautifully. I knew then that we had trained him well. Shortly after he returned he was telling me about how he was going out to dinner with some friends and that he would ensure he ordered a safe meal. I realized that the thought hadn’t even crossed my mind to be concerned. I told him that he’d made it through 9 countries and 33 cities during almost 5 months, and if he could do that without an allergic reaction, I knew he could take care of himself going to a restaurant in Denver! Morgan grew from a boy into a man during college, which is what we all hope our children will do. He’s ready to step into the work world with his first “real” job as an Economic Development Specialist for the Longmont, Colorado Economic Development Partnership. I will continue to have to work on letting go of him and his food allergies, asthma and various other medical conditions. I’ll always be a Mom!